Because President Coolidge had announced unexpectedly he would not run for re-election in 1928, Commerce Secretary Herbert Clark Hoover became the natural front-runner for the Republican nomination. Former Illinois Governor Frank Lowden and Kansas Senator Charles Curtis were candidates for the nomination but stood no chance against the popular and accomplished Hoover. Chicago Mayor William Hale Thompson considered himself a candidate, but without the support of Ruth Hanna McCormick, his candidacy was unsuccessful. Hoover was nominated on the first ballot with 837 votes to 72 for Lowden and 64 for Curtis and the rest scattered. John L. McNab delivered Hoover's nomination address. In his acceptance speech he said, "We in America today are nearer to the final triumph over poverty ever before in the history of any land." That and other optimistic remarks about the country's future were used against him in the 1932 election, which he lost to Franklin Roosevelt. The platform praised the Coolidge administration for the prosperity of the mid-1920s, and also promised reduction of the national debt, tax reduction, retention of the protective tariff, opposition of cancellation of foreign debts, settlement of claims from World War I from foreign governments, continuation of the Coolidge foreign policy, support of arbitration treaties, civil service protection, a tariff for agricultural protection and continued farm exports, aid to the coal-mining industry, continued appropriations for highway construction, the right to collective bargaining, regulation of railroads, a continued independent American merchant marine, government supervision of radio facilities, construction of waterways to help transportation of bulk goods, support for war veterans, federal regulation of public utilities, conservation, vigorous law enforcement, honest government, continued reclamation of arid lands in the West, improvement of air-mail service, restricted immigration and naturalization of foreign immigrants in America, continued enforcement of the Washington Naval Treaty, continued status of territory status for Alaska and Hawaii and called for more women in public service, right of the President to draft defense material resources and services, creation of an Indian Commission, an Anti-Lynching Law and promised continued Home-Rule for the American Citizen. After Coolidge announced that he would not run for a second full term in August 1927, Hoover emerged as the frontrunner. Illinois Governor Frank Lowden, Vice President Charles Dawes, and Senators James Eli Watson of Indiana, Charles Curtis of Kansas, Guy D. Goff of West Virginia, and Frank Willis of Ohio also loomed as potential challengers to Hoover. Hoover had won respect by many for his work in the Wilson, Harding, and Coolidge administrations, but many party regulars distrusted his loyalty to the party on issues of both policy and patronage. Some progressive Republicans, such as California Senator Hiram Johnson, also disliked Hoover, but others, such as Senator William E. Borah, favored Hoover's candidacy. Many party leaders pressured supported of the Treasury Andrew Mellon to run, but at 73, Mellon felt that he was too old to run in 1928. Mellon sought to convince former Secretary of State and 1916 Republican nominee Charles Evan Hughes to run, but Hughes refused to campaign for the nomination. With no strong alternative, Hoover appeared to be the likely nominee at the start of the convention, but many in the party still opposed his candidacy. A "draft Coolidge" movement emerged, but the movement collapsed once it became clear that Coolidge would not run again. With Coolidge out of the running, Senate Majority Leader Charles Curtis tried to rally Hoover's rivals around his own candidacy. However, Hoover won the nomination on the first ballot. At the start of the convention, Vice President Charles G. Dawes, former Kansas Governor Henry Justin Allen, New Jersey Senator Walter Edge, New Hampshire Senator George H. Moses, Connecticut Representative John Q. Tilson, and Ambassador Alanson B. Houghton were mentioned as potential running mates for Hoover. Kansas Senator Charles Curtis was also mentioned as a possibility, but he was not yet ready to concede the presidential nomination to Hoover. After Hoover won the presidential nomination, Moses, Illinois Senator Charles S. Deneen, and former Massachusetts Governor Channing Cox were named as the most likely vice-presidential nominees, with a re-nomination for Dawes also a possibility. Party leaders considered nominating Cox or Dawes, but Cox was vetoed by Utah Senator Reed Smoot, and Dawes was unacceptable to Hoover and Coolidge for supporting McNary-Haugen. Curtis, possibly with the support of Coolidge, was nominated by the party leaders, and the convention ratified the choice. Each of the four days of the convention opened with a lengthy invocation by a different clergymen—one Jewish, one Catholic, one Episcopalian, one Methodist. Together, these four religious groups formed a majority of Americans at the time. All of the clergy were based in Missouri, where the convention was held. Each was listed among the convention officers as an official chaplain. On June 12, the opening prayer was given by Bishop S. C. Partridge of the Episcopal Diocese of West Missouri. Speakers on the second through fourth days were Catholic Bishop Thomas F. Lillis of the Diocese of Kansas City, Rabbi Herman M. Cohen of Congregation Keneseth Israel-Beth Sholom, Kansas City, and Bishop E. L. Waldorf of the Methodist Episcopal Diocese of Kansas City. ^ Newill, Cody (June 11, 2014). "A Look Back At The 3 Times Kansas City Hosted National Political Conventions". KCUR. Retrieved 2014-12-14. ^ "Thompson v. McCormicks". Time. Time, Inc. 1930-11-03. Archived from the original on 5 June 2008. Retrieved 2008-05-02. ^ a b c d Oulahan, Richard V. (13 June 1928). "Hoover Certain on First Ballot as Convention Opens; His Rivals May Unite on Curtis in Final Fight on Him; Wets in Force Urge Dry Law Repeal Plank in Platform". New York Times. Retrieved 9 October 2015. ^ Oulahan, Richard V. (15 June 1928). "Hoover Named on First Ballot by 837; Lowden Second With 74; Curtis Gets 64; Farmers Squelched on Floor, 807 to 277". New York Times. Retrieved 9 October 2015. ^ a b Clements, Kendrick A. (2010). The Life of Herbert Hoover: Imperfect Visionary, 1918-1928. Palgrave Macmillan. p. 410. Retrieved 9 October 2015. ^ "Our Campaigns - US President - R Convention Race - Jun 12, 1928". Archived from the original on 2009-06-15. Retrieved 2009-06-10. ^ "Our Campaigns - US Vice President - R Convention Race - Jun 15, 1928". www.ourcampaigns.com. Retrieved 4 April 2018. 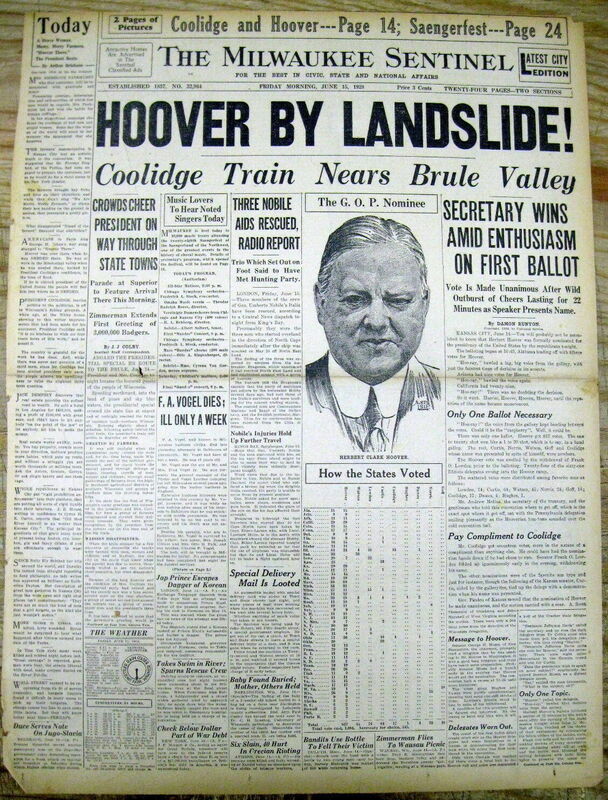 ^ "Hoover By Landslide!". The Milwaukee Sentinel. Milwaukee, Wisconsin. June 15, 1928. Retrieved January 7, 2018. ^ "Hoover Partisans Confident of his Early Nomination" [Associated Press story], Deadwood (S.D.) Daily Pioneer-Times, June 10, 1928: "Ministers of four denominations have been selected to deliver opening prayers during the first four days of the convention." ^ "Hoover to be Chosen on First Ballot" [Associated Press story], Roseburg (Ore.) News-Review, June 12, 1928: "While delegates and spectators stood, Bishop S. C. Partridge of the Episcopal Church pronounced the opening prayer petitioning for 'peaceful and harmonious' party consultations." ^ Damon Runyon, "Runyon Likens Hoover Victory to Hand Gallop" [Universal News Service story], Charleston (W.Va.) Gazette, June 15, 1928: "Rabbi Herman M. Cohen of Kansas City, swarthy and well groomed, and looking like a young Prince of Israel, prayed for the Republicans." ^ "It Looks Like Curtis Running as Vice Pres," Olean (N.Y.) Evening Times, June 15, 1928: "Finally, most of them sat down, then rose again immediately to hear the invocation pronounced by Bishop E. L. Waldorf, of the Methodist Episcopal Church of Kansas City. He prayed 'the blessings of God for the man who had been given the great place' by this convention last night. He also asked for Divine protection for the delegates on their homeward journeys."